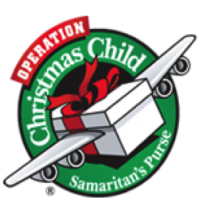 We're gathering gifts for children around the world through Operation Christmas Child again this year. * Labels and instructions are available now or at samaritanspurse.org. A $9 donation per box for shipping and handling is requested. * Boxes are now available. Be sure to pick them up at our services! * Nov. 18, we will collect packed boxes at service. Please bring your boxes in prepared and with a good, solid band around them to keep the contents inside! Follow instructions on labeling as well, remembering that you can accomplish some of this online, if you want to track where your gift boxes are sent. Thank you so much for your generosity to these children in need! Pastor Joyce Swingle told about how she felt led to share with the check-out clerk why she was making her purchases, and the clerk told how her daughter received a box after their family was affected by Superstorm Sandy. The woman said she didn't realize it was individuals that packed the boxes. Bless someone where there is a need somewhere in the world, close to home or on the other side of the world. Click here for more information and to register your box online so you can see where in the world a child receives your box.